The garbage disposal was invented by InSinkErator and today they continue to be the largest manufacturer of food waste disposal products. They have built a trusted name, and you can buy wholesale InSinkErator parts right here at PlumbersStock. InSinkErator disposals are developed with user convenience in mind. For instance, the InSinkErator Evolution Series features advanced sound, grind, anti-jam, and anti-vibration technologies. No one has done more in researching, innovating, and designing advanced technologies for disposals than InSinkErator. Over the past 10 years, InSinkErator has invested millions in research and development to publish dozens of patents. Furthermore, they have partnered with universities, researchers, and municipalities from around the world to seek smarter ways to convert food waste into renewable energy and fertilizer. As you browse through the products below, you will see that there are different motor sizes on various disposals. This is important, because over use or straining with a lot of food could actually ruin your motor. Motor sizes are most commonly found in 1/3 hp (horsepower), 1/2 or 1. Other sizes can also be found on occasion. 1/3 hp - Are recommended for a single person home or apartment. 1/2 hp - These are great for a smaller family. 1 hp - If you are part of a large family, a 1 hp motor would be great. 2-3 hp disposals - For those of you who own a food service business or have another commercial use you are going to need a high-powered motor to keep up with the strain of constant use. Badger Series - These garbage disposals are great when you are looking for a reliable but affordable option. InSinkErator Evolution Series - These disposals are great and extremely innovative. They have a quieter performance and a mounting system that allows them to be installed quickly and easily. Evolution Septic Assist - This disposal is for those who have a Septic system to remove the waste from their home. InSinkErator designed this disposal with a chemical called BioCharge, which releases a liquid that helps to dissolve the sludge at the bottom of your septic tank. These cartridges last around 4 months on average. Evolution Compact - This gives you a lot of power (3/4 hp) with a more compact (34.6 oz.) disposal. Evolution Cover Control - This is a unique disposal in that it does not use a wall switch in order to activate it. The disposal uses a magnetic cover start activation and it will only turn on when done manually. Sink Baffles/Gaskets - These are necessary for two reasons; first, they help quiet the disposal motor. Second, the gaskets help to keep the waste from shooting back up into the sink while it is on grinding food waste. Instant Hot/Cold Water Faucets - This is a great addition to any kitchen sink. At the pull of a lever, you can have 200 degree Fahrenheit water instantly to make any hot drink quickly. When it comes to quality products for your kitchen sink, you cannot choose a better manufacturer than InSinkErator. They are the leaders when it comes to quality, efficient garbage disposals. Maybe you already know you want, say, an InSinkerator 333, but if not use the filters on the left to refine the results for the criteria you seek in your purchase. Here at PlumbersStock, we have a dedicated staff to help you find the right Disposal or Instant Hot/Cold Water Faucet from InSinkErator for your needs. Do not hesitate to contact us with any questions you have, and thank you for choosing PlumbersStock.com as your place to shop for all your plumbing needs. 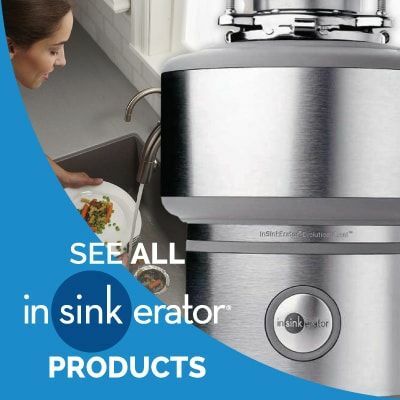 Learn more at InSinkErator.com.